Mylan is not alone in their medical consumer hostage taking. Although there are vague noises about Congressional hearings, Mylan has little reason for concern. They have dropped the retail price of an Epipen by $100 a dose, with rebate coupon, to “qualified” customers. Their profits will still be enormous. Hearings at the Capitol building will involve Mylan using this to deflect criticism with help from CEO Heather Bresch's father, Senator Joe Manchin (D-WV). Senator Manchin won his seat in a 2010 special election following the death of former KKK Exulted Cyclops Senator Robert Byd (D-WV). Bresch got her start at Mylan in 2000 when her father used his influence as a West Virginia State Senator to get her a job while chatting with the then CEO of Mylan at a WVU basketball game. She worked her way up the ranks to CEO herself while her father worked his way through the Governor's mansion to the US Senate. Her price gouging on the Epipen was the beginning but not the end and she could not have done it without tax-avoidance and prison slave labor, which would have made her father's political predecessor so proud. In 2014 Bresch oversaw Mylan's purchase of Columbus based Abbot Labs for $5.3 billion. Abbot labs is a leading manufacturer of diabetes test strips, which must be used by those who have diabetes daily, sometimes up to five times per day. They cost around 15 cents to make. Abbot lab's leading brand, Freestyle Lite, sells at $289 for 100 strips, although there were discount offers for merely $59.99. This is a markup of 400%-1900%. Freestyle Lite strips are made in part with prison labor, which pays less than $1 per hour. 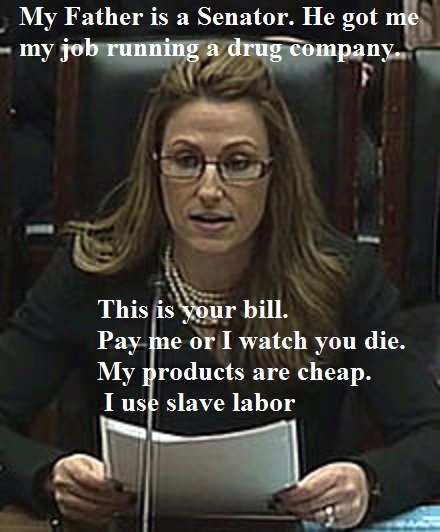 Mylan's labor is subsidized by the taxpayer keeping it's labor force cheap, obedient and union free, and their price gouging is subsidized by Medicare and a barely regulated insurance market. With political protection on Capitol Hill granted by her father's seat in the Senate, Mylan's $43 per share price will likely rise with Bresch's restructuring of Abbot Labs to move it's headquarters to the Netherlands. This will reduce their already low tax burden by an additional five percent. Mylan is joined in holding the nearly 30 million Americans with diabetes hostage by another pharmaceutical giant, Eli Lilly. While some brands have raised the price by 530% to around $1500 for a months supply, Eli Lilly has not gone as far yet. Their subsidiary, Gland Pharmaceuticals, retails their Humulin product for $140 a vial. A month's supply would only be $800 by my straw calculations. This is the average rent on a 2 bedroom apartment in Columbus Ohio or a little less than one third of a full time living wage of $15/hr before taxes. Keeping in line with Mylan's political influence, Eli Lilly can name a number of political dynasties amongst it's board alumni, including George H.W. Bush and the father of his Vice President Dan Quayle. With solid bi-partisan connections to multiple families of political aristocrats, Big Pharma's lock on nearly free slave labor seems destined to be eternal. We the taxpayers finance their slave workforce while they avoid taxes. 11% of Americans must buy their products at whatever price they choose or they simply die. The federal government subsidizes some of the vastly inflated costs of the drug to hostage consumers through medicaid and medicare. The tax burden is placed off shore where it can be reduced. This business model is one that can not fail and is worth investing in, as if anyone has anything left to invest with after their medical co-pays.